Admittedly, the first time I heard of the peperomia caperata, I thought it was akind of medical condition like heterochromia iridis. Imagine my surprise when I met the unique and intensely-colored tropical plant, the Emerald Ripple. Peperomia caperata is an evergreen perennial featuring red-purple stems ending in dark green-crimson, wrinkled, plump, and heart-shaped leaves withred to pink panicles that resemble mouse tails terminating into delicate white flowers. Truly, the peperomiacaperata is a one-of-a-kind, if not spectacularly colorful, plant. Don’t just take my word for it. The Royal Horticultural Society awards the peperomiacaperata (also Luna Red) with the Award of Grand Merit (AGM). So, what’s so great about the AGM? 2. Safe And Non-Toxic For Pets! If that merit award doesn’t convince you, I don’t know what will. In any case, let’s start growing! What does it take then to grow this award-winning flowering plant? 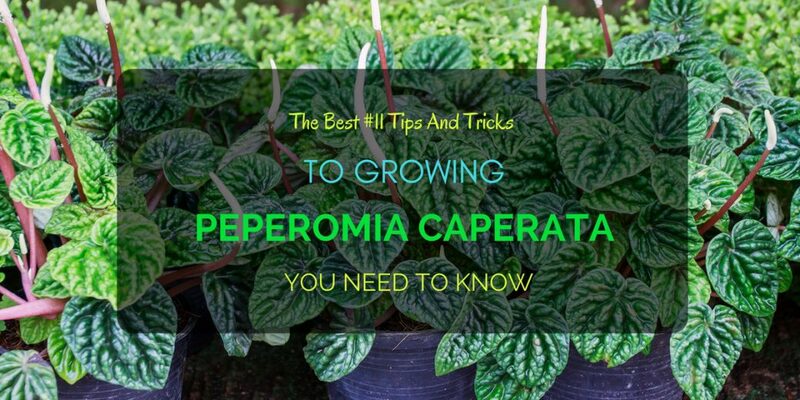 Below, I’ve listed the tips and tricks you need to know to grow and care for peperomiacaperata at home! Take a breath and stop worrying. The Luna Red is very forgiving with its care and easy to grow, which is probably the reason why it’s very popular as an indoor house plant. Additionally, it is a compact plant growing to a height of about 8 inches. This tiny stature makes the peperomiacaperata perfect for small spaces such as apartments or offices. There’s no need to worry about a poisoning a beloved cat or dog since the entire genus of Peperomia is completely safe! Although the Luna Red is easy to grow, this doesn’t mean you can place the plant anywhere and then forget about it. Rather, knowing that it naturally grows in tropical rainforests means you can try to emulate these same conditions at home. Then, one important condition you’ll find in a rainforest is the high humidity. Hence, bathrooms and kitchens will be ideal for Luna Red (40-50% relative humidity), although common living rooms will suffice. However, remember that regularly air-conditioned rooms or offices might not have enough moisture for the plant to thrive. Another perk to naturally growing in the shade of larger trees is the Luna Red’s ability to thrive in indirect as well as artificial lighting. On the other hand, you can go beyond your office's fluorescent lights by placing the Luna Red under indoor grow lights. Note, though that direct sunlight will burn the plant’s foliage. If you notice stunted growth in your peperomia, then it might be receiving insufficient light. The Luna Red is an ideal room temperature plant, flourishing at 65°F -75°F (18°C -24°C). So, if possible, avoid temperatures below 60°F. You can start growing a Luna Red by using either seeds or softwood cuttings namely, leaves, leaf buds, and young stem tips. If you’re using seeds, remember to sow at 65°F -75°F when they’ve ripened. On the other hand, you can also start with softwood cuttings which I recommend. Cut a leaf, leafbud or new and still soft stem tips then let the cut ends dry out before planting. Peperomiacaperata prefers non-compact soil with plenty of air circulation so remember never to tighten or tamp down on its soil bed. Additionally, you can choose to mix in some perlite to guarantee aerated soil. The Luna Red is very similar to succulents in that it requires little water and is drought-tolerant. Hence, avoid oversoaking the soil and water only when it has just dried up. Additionally, focus watering its base since wet leaves may encourage plant diseases. Puttinga little Luna Red in a pot that is too large as well as too small may result in soaked roots. Therefore, make sure to keep your plant in a pot that is just right for its size, then repot when necessary, preferably in spring time. Most importantly, the chosen pot should easily drain water. You cannot underestimate the danger of waterlogged soil which can cause root rot. The Luna Red will benefit from monthly feeding from spring to fall with the diluted liquid fertilizer. However, take care that you do not overfeed or apply during the winter season. Schedule a routine check on your Peperomia to hinder any harmful pests or insects such as aphids and mealy bugs. If spotted, gently wipe off with a damp cloth or towel. Just remember these 11 tips and tricks, and you’ll have a plump and healthy Luna Red at home or in the office! As always, happy planting!